This is a continuation of the four part “Interesting U.S. President Facts” series. If you’re interested in the other parts, you can find them here: Part 1, Part 2, and Part 3. The “S” in Truman’s middle name doesn’t stand for anything. His parents picked it to honor both of his grandfathers, Anderson Shipp Truman and Solomon Young. 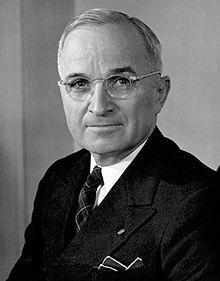 Truman worked a variety of odd jobs as a young man, including a timekeeper for the Santa Fe Railroad; during this time, he would sleep in the hobo camps. Because of his poverty, his proposal to Bess Wallace was rejected, which was a turning point in his life, motivating him to “make more money”. Truman attempted to go to college and then law school, but dropped out of both quite quickly. He also attempted to go to West Point, but was rejected because of his bad vision. He then attempted to join the National Guard, which he managed to get into only after memorizing the eye chart, so that the testers wouldn’t know about his vision problems. Truman’s inauguration for his second term as President was the first ever to be televised nationally. During Truman’s time as President, he ordered an addition to the White House to accommodate his family. When the people hired started examining things for what they’d need to do for the addition, they found the 130 year old White House was completely dilapidated, including a collapsed floor in the President’s bedroom and they closed his bathroom as being completely unsafe to use. Once the addition was done, Truman was told that it was the only part of the White House that could be trusted as structurally sound. As such, he ordered a complete renovation of the White House, which took three years. As a child, Eisenhower was supposed to be watching his little brother, but didn’t. His brother then had an accident that resulted in him going blind in one eye. 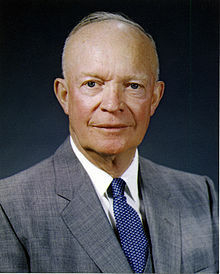 Every child in Eisenhower’s family was nicknamed “Ike”, “Little Ike” was Dwight’s nickname. After he rose to the position of 5 star general, he was the only one in his family that was still referred to as Ike. Eisenhower’s later life all hinged on a potentially life threatening decision he made as a freshman in school. He had hurt his knee, which led to a leg infection. The doctor told him he would die if he didn’t allow the leg to be amputated. Eisenhower refused to allow the surgery, but did not die obviously. Had he taken the doctor’s advice, he never would have had a military career, nor become President. While at West Point, Eisenhower once tackled legendary athlete Jim Thorpe during a football game in 1912. Eisenhower was also a cheerleader for the junior varsity team. This wasn’t because of lack of women at West Point, but because in the early days of cheerleading, the cheerleaders were always men. Eisenhower said of his life’s regrets, “not making the baseball team at West Point was one of the greatest disappointments of my life, maybe my greatest.” That’s either a testament to a life well led, or a testament to how much he loved baseball. Kennedy was the first U.S. President born in the 20th century. While President, JFK once had a proposal put on his desk that had been approved by the Joint Chiefs of Staff to have the government commit acts of terrorism on U.S. soil and then frame Cuba for it, so that the U.S. could go to war with Cuba. 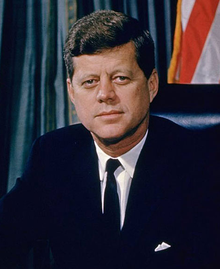 President Kennedy wasn’t too pleased with it and rejected it wholly and further told General Lemnitzer, the chairman of the Joint Chiefs of Staff, that the U.S. would not be going to war with Cuba, something the military and CIA had been strongly pushing for since Castro had taken over there in 1959. General Lemnitzer was shortly thereafter let go as the Chairman of the Joint Chiefs of Staff when his term expired. The result of Kennedy rejecting this and other similar proposals was that he progressively became more unpopular throughout the military brass, particularly for being “soft on Cuba”. And note, John F Kennedy’s famous “Ich Bin Ein Berliner” comment was not interpreted as “I am a Jelly-Filled Doughnut” as you’ll often read and occasionally hear. His statement was 100% correct in its wording in terms of what he meant to say. You can read more on this here and how the “Jelly Filled Doughnut” myth got started. 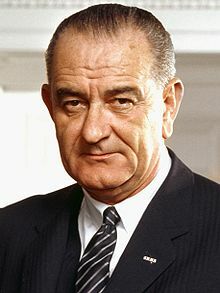 Johnson served as a Representative, a Senator, a Vice President, and finally a President, making one of just four people to serve in each of the four elected federal offices. Before getting into politics, he was a High School teacher in Pearsall, Texas. 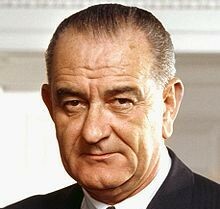 Johnson liked to name things after his initials “LBJ”, such as his daughters Luci Baines and Lynda Bird, and his dog Little Beagle Johnson. The White House was almost destroyed during Nixon’s administration. This happened thank to Samuel Byck, who was bent on assassinating Nixon. He successfully managed to take over a Delta Airlines plane, but didn’t manage to get it off the ground as he’d shot a security guard before getting on the plane, alerting the authorities to the trouble. His plan had been to have the pilots take off, get reasonably close to the White House, then he’d kill them and crash the plane into the White House, hopefully killing the President in the process. Byck sent one of his letters explaining what he was about to do and why to famed reporter Jack Anderson, who himself had been a target for assassination, this time by someone in the Nixon administration. Two members of the Nixon administration, G. Gordon Liddy and E. Howard Hunt, admitted under oath that they had been ordered by a “senior White House aide” to kill Anderson. Once ordered to do so, they set about trying to find a way to either poison him or murder him via a mugging to make it look like a random event. They even met with a CIA operative to discuss the best way to go about killing him. Luckily for Anderson, both conspirators were arrested just a few weeks later, being part of the Watergate scandal. 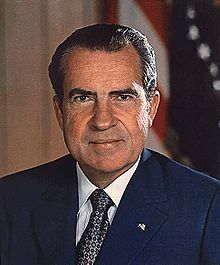 Liddy later stated that Nixon had issued the following statement: “We need to get rid of this Anderson guy”, which set in motion the plot to kill Anderson. However, Nixon wasn’t apparently involved in directly ordered the killing, nor supposedly knew anything about it. He just simply stated Anderson needed to be gotten rid of and his people figured the best way to “get rid of” Anderson was to kill him. Nixon apparently had been upset with Anderson since 1960 when Anderson revealed on the night before the presidential election that Howard Hughes had given a substantial “loan” to Nixon’s brother. Anderson also uncovered the fact that the Nixon administration was systematically harassing John Lennon during their attempt to get him deported. 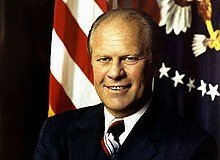 Gerald Ford was actually born “Leslie Lynch King, Jr.” He changed his name later in life to be named after his stepfather, Gerald Ford. Ford’s mother had left his biological father shortly after “Gerald” was born. This was after Ford’s father threatened to kill her with a butcher knife. He had previously also been abusive, with the first time he ever hit her on their honeymoon when she looked at another man. Not surprisingly, Ford didn’t want to be the “Jr.” of a father like that, so once he was an adult, he changed his name to match his step-father’s name. 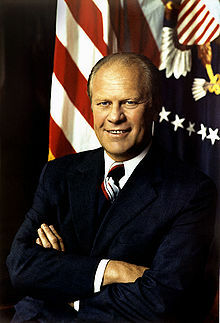 Ford was the first person ever to become Vice President and President without being elected via the Electoral College, inheriting the Presidency after Nixon’s resignation and becoming Vice President after Spiro Agnew resigned the position. While his time as President is the shortest of any President who didn’t die in office, Ford currently holds the record for the longest lived President at 93 years and 165 days. Jimmy Carter was the first President ever born in a hospital. Before politics, Carter was a peanut farmer. His family had been quite wealthy, but upon his father’s death, his father had canceled many of the debts owed to him and had widely distributed his remaining wealth, leaving Carter with little. Carter even for a while lived in public housing because of it, making him the only President to ever live in subsidized housing for the poor. Once he took over management of the family peanut farm, though, it blossomed and by 1970 he was relatively wealthy. During a partial meltdown of the NRX reactor in Canada’s Chalk River Laboratory, Carter led a team of U.S. soldiers to help shut down the reactor by disassembling it, which Carter and his team did, with each person, including Carter, one at a time lowered into the reactor for a short period before being replaced by the next person. 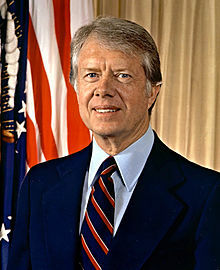 Carter is the only President to receive a Nobel Prize after leaving office, being awarded one (a Peace Prize) in 2002. Presidents who have received such a prize while in office are Theodore Roosevelt, Woodrow Wilson, and Barack Obama. 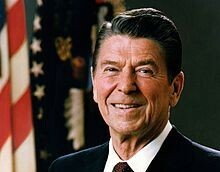 Reagan’s first job was as a life guard, where he reportedly took part in 77 rescues. Before getting into acting and then politics, Reagan was a sports announcer, first starting out broadcasting Hawkey football games in Iowa for $10 a game. He later got a job as a Chicago Cubs announcer before eventually landing a 7 year contract with Warner Brothers as an actor, after a screen test in 1937. He later worked for General Electric Theater and reportedly gave an average of 14 speeches per day while with them. Reagan is the only President who had a marriage that ended in divorce, divorcing his first wife, Jane Wyman, supposedly separated over Reagan’s political ambitions. 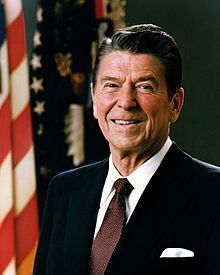 He later married actress Nancy Reagan, who he often called “Mommy”. While at Phillips Academy in Massachusetts, Bush was the captain of the varsity baseball team and the captain of the varsity soccer team. Later, at Yale, he was the captain of the Yale baseball team, playing first base. He also played in the first two College World Series and met Babe Ruth during his senior year. Besides playing in sports, Bush was a cheerleader at Yale. 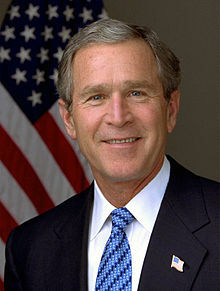 Bush managed to graduate college in 2 1/2, rather than the customary four. Directly before attending Yale, Bush joined the military to fight in WWII, becoming the youngest naval aviator in U.S. history, at the age of 18. During one attack, Bush was to attack a Japanese installation, but his plane was hit and caught fire. Despite this, he went ahead and completed his mission, dropping bombs on the target, before flying out to sea and ejecting. Bush parachuted down over the water and sat in a raft until rescued by the USS Finback submarine. His partner in the plane wasn’t so lucky as his parachute hadn’t opened. 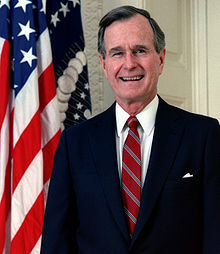 Bush is only the third President (after Eisenhower and Reagan) to ever receive an honorary knighthood, which he was granted in 1993 by Queen Elizabeth II. 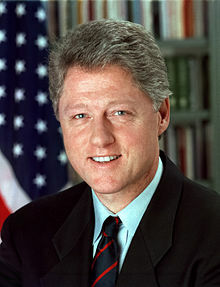 William Clinton was actually born William Jefferson Blythe, III. His biological father was a traveling salesman who died in a car crash shortly before Bill was born. 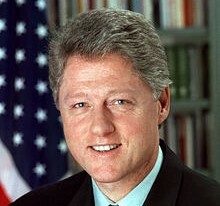 Bill adopted the last name of his stepfather, Roger Clinton Sr. when he was 15 years old. However, while this was apparently done in homage to his stepfather, Bill Clinton has stated that Roger Clinton was an alcoholic, an obsessive gambler, and was abusive to his mother, himself, and his half brother. While working at a campaign office in Texas, Clinton once worked with future filmmaker Steven Spielberg. Osama bin Laden almost managed to have Clinton assassinated, having his agents plant a bomb under a bridge which Clinton’s motorcade would be driving over. Before driving over the bridge, the plot was discovered and the motorcade diverted. 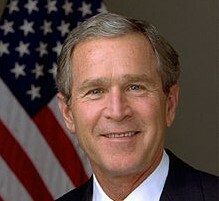 During high school at the Phillips Academy, Bush was the head cheerleader during his senior year. At Yale, he also was a cheerleader. He met his wife, Laura Welch, at a barbecue. Bush proposed to her just 3 months later. He often credits Laura for “smoothing out his rough edges” (referring to his earlier alcohol and drug problems). Obama was not just the first black President of the United States, but also the first black president of the Harvard Law Review. He also taught constitutional law at the University of Chicago for 12 years, during which he served eight years as a Senator. 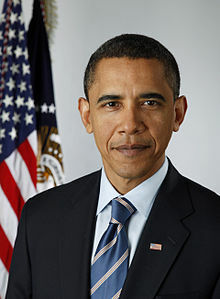 Obama’s father, Barack Hussein Obama Sr. from Kenya, graduated with a degree in economics from the University of Hawaii and later a masters in economics from Harvard, before returning to Kenya. His mother later married an Indonesian man. He has a half sister from his Indonesian stepfather and mother, and 7 half siblings from his Kenyan father. He also has Irish cousins. 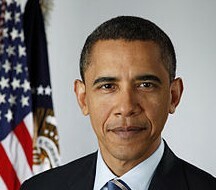 Obama said of his relatives, “It’s like a little mini-United Nations… I’ve got relatives who look like Bernie Mac, and I’ve got relatives who look like Margaret Thatcher.” Obama also claimed in his book Dreams From My Father, that his mother’s family is distantly related for the former President of the Confederate States of America, Jefferson Davis. When Obama first asked his future wife, Michelle Robinson, out on a date, she turned him down. The two later started dating and were married a little over three years after they first met in 1989 at the Chicago law firm of Sidley Austin, where Michelle initially served as Obama’s adviser at the law firm. If you know any more interesting Presidential facts about any of the above, please leave them in the comments below. You can find facts about the rest of the Presidents here: Part 1, Part 2, and Part 3. Regarding Ike’s cheerleader days at West Point, Until the 70’s, there were no women students at The Academy. everything in there about Obama is a lie outright it has uncovered and proved so fix it! I see free speech isn’t allowed here.